A goldfinch sits and waits for its turn to feed. So sweet & pretty, lovely shot. I've said once, twice, maybe three times; but here I go again.....I LOVE the color combinations of this bird; it reminds me of one of my favorite attires: black dress pants, a white turtleneck, and a yellow wool jacket or yellow cardigan.....accented with silver jewelry! What a great portrait of this beautiful Finch. I can see where they get their name, they are so pretty!!!! 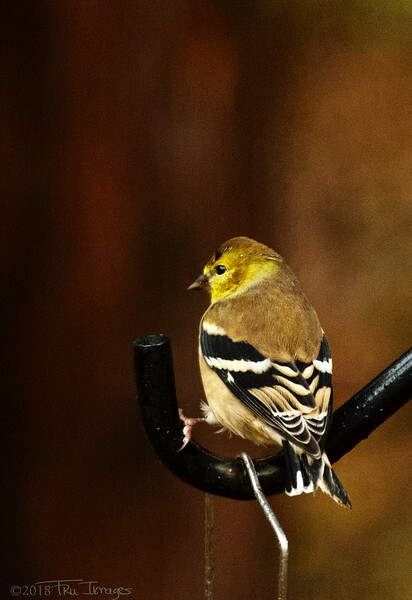 Very nice view of this American Goldfinch in its winter garb.